With TrainingEdge, you always come out inspired. ALWAYS. We always take pride in our ability to create an inspiring learning environment which focuses on you, the participant. "The mind is not a vessel to be filled but a fire to be ignited." to your needs; then, we deliver a program that is worthy of your investment. TrainingEdge was established on July 2006 in response to the growing need of small and medium enterprises (SMEs) for performance-oriented yet values-based learning interventions. 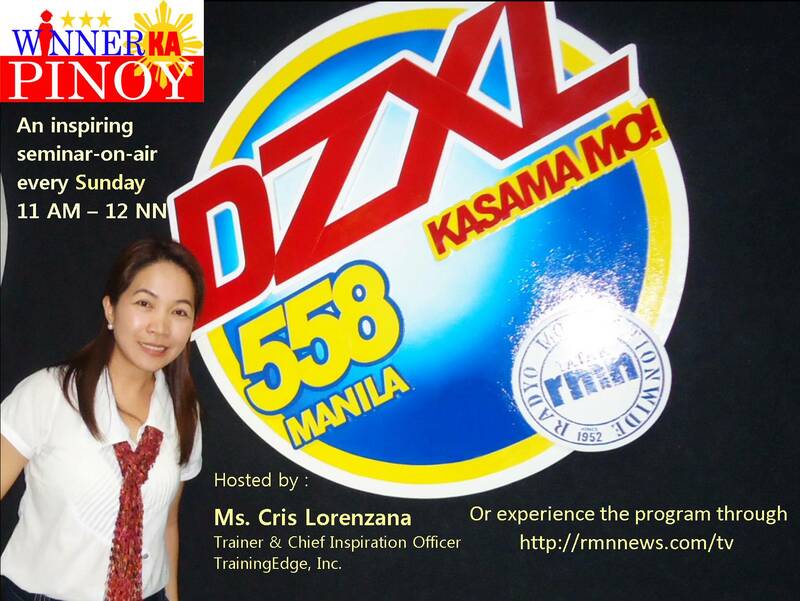 It is under the leadership of Ms. Criselda G. Lorenzana, its Founder and Chief Inspiration Officer. TrainingEdge is dedicated to enhancing the capacity of organizations through a wide array of courses on staff and management development. We have a unique way of integrating training with any organization’s vision, mission, core values, strategies and/or initiatives. We are driven by a sincere desire to support partner-organizations and their human resources in meeting their set performance and productivity goals. To be the preferred learning partner of most transformative organizations in the Philippines. We will create unique and memorable learning experiences where each participant always comes out inspired to do and be more. 1) We shall provide exceptional and professional service AT ALL TIMES. 2) We shall engage and energize everyone with a positive and loving attitude. 3) We shall continue believing in the capacity of each individual towards greatness. One very effective way to educate is to inspire. WINNER KA, PINOY! is an inspiring radio program which aims to awaken and sustain the winner in us, Filipinos, through enduring principles and values. EXPERIENCE WINNER KA, PINOY! VIA LIVE STREAMING, CLICK HERE. Inspiring ideas and stories can change a life, a family, a community and eventually, our country. Let us, therefore, please share our blessings by empowering others - especially those who do not have the opportunity to attend life-changing seminars - to become their best selves and to achieve much greater things. Henri Frederic Amiel said that “thankfulness may consist merely of words; but, gratitude is shown in acts.” Please include supporting WINNER KA, PINOY! as part of your organization’s ‘gratitude acts’ and ‘pay-it-forward’ initiatives. You may become a program sponsor or you may order audio CDs of our past episodes at only P 50/CD plus delivery charge. You may get in touch with the program host, Ms. Cris Lorenzana, through [email protected] or the contact details below for more details. Thank you so much. And, may your generosity return to you a thousand fold. "Learning… should be a joy and full of excitement. men, not a conducted tour through a jail." Our partner-organizations may outsource their training and development function to us – either through on-site/in-house customized seminar-workshops, publicly organized learning programs or consulting arrangements. TrainingEdge is your partner in transformation. We listen to your needs; then, we deliver a program that is worthy of your investment. In-house training is a cost-effective and highly-flexible approach in improving the competencies of human resources. •	With the involvement of line managers, the positive effects of the training may be reinforced on the job through coaching and/or counseling. When organizations partner with TrainingEdge, they are always in control of the way in which their training program is designed, delivered and evaluated. Our strength is in our content and methodology. We do more than just impart knowledge or transfer skills... we inspire and enable change. Our course contents are flexible in format and we use approaches that build on learner strengths and knowledge. We take pride in our ability to create an inspiring learning environment which focuses on the participant and not on the facilitator. After all, it is the learner whose knowledge, skills, attitude or behavior is expected to change. WE CARE and we highly value your investment and trust. As such, we will refund your investment in full if the learning program we facilitated has not been a satisfactory experience for you. You only need to submit a written request along with the reasons for your dissatisfaction. Then, we refund your investment in FULL. NO QUESTIONS ASKED. FURUKAWA ELECTRIC AUTOPARTS PHILS., INC.
IP CONVERGE DATA CENTER CORP. ISS FACILITY SERVICES PHILS. INC.
JARDINE LLOYD THOMPSON INSURANCE BROKERS INC.
METHODE ELECTRONICS FAR EAST PRIVATE LTD.
SHI DESIGNING & MANUFACTURING, INC.
SUNPACK CONTAINER & PACKAGING CORP. THE MANULIFE INSURANCE CO. (PHILS. ), INC.
TrainingEdge, Inc. "Your Partner in Transformation"
Program Host: WINNER KA, PINOY!